1. Wash and chop the Asparagus into small pieces. Chop green chillies and garlic. Set aside. 2. Heat 1 tsp of oil in a pan. Add chana dal, Urad dal, green chillies one by one and sauté for few minutes. Add garlic, chopped asparagus and little salt. Fry them till the asparagus get tender. Switch off the stove and let it cool. 3. Grind the step 2 ingredients along with tamarind, ginger, groundnut and some water into fine paste. 4. Season it with mustard and curry leaves. 5. 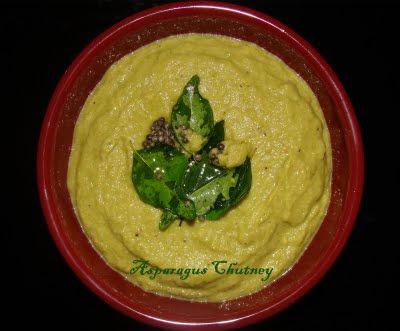 Asparagus chutney goes well with chapati, dosa, idli, rotti etc.